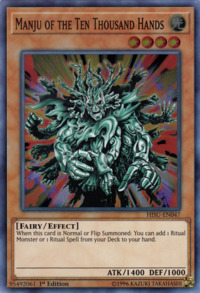 This card has counterparts known as Senju of the Thousand Hands. 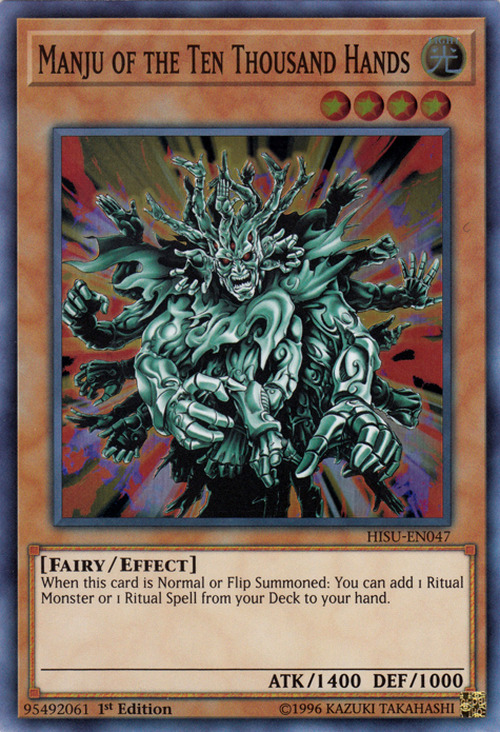 Senju is a weaker version of this card, as it only adds Ritual Monsters, while this card add either a Ritual Monster or a Ritual Spell. As such, Manju can also be considered an improved counterpart of Sonic Bird, which searches only Ritual Spells. Including the hands on his head, this card has 31 visible hands. This card's artwork is based on the international artwork of Senju of the Thousand Hands. Manju means ten thousand hands.